Another tough away game for the Ravens who had a squad ravaged by injury and unavailability. Bridgend welcomes returning goalkeeper Adam Hawas, who put in a great performance making a number of superb saves throughout the game. Bridgend started bright winning a short corner, David Knight employed some superb trickery whilst Michael Hodges made a dummy run to allow Rhys Owen a free shot on goal putting the visitors in the lead. The rest of the half saw Bridgend frustrated as they were unable to make the appropriate decision in the final third. The lack of product hurt Bridgend as they conceded twice from counter attacks. The second half saw Bridgend consolidate and move the ball around better, again they found difficulty in the final third and were unable to generate an effective attack. A tussle in the ‘D’ saw Bridgend concede a penalty flick which was scored by Chippenham. Bridgend scores a well deserved consolation goal after Michael Hodges make a superb run down the right and crossed to Steve Murphy who’s reflexes belied his age as he swiped the ball past the incoming keeper. A better performance from Bridgend who must work on the positives and further eliminate the negatives to get results which truly reflect their ability. After watching the 2s get their first 3 points of the season. The 3XI knew they had to perform. The first 5 minutes were controlled by Whitchurch as Bridgend were trying too hard to chase the ball. As Bridgend composed themselves, the game turned on its head. Bridgend started to dominate and control the possession. This lead to numerous chances and Bridgend quickly pulled away. By half time it was 8 – 0 and Bridgend wanted more. The second half was a lot slower as both teams began to tire. Whitchurch were trying to gather some momentum but a stubborn defence of Taron Moss, Denver Beer and Jeremy Ingram held firm with Cliff Harrison in goal commanding them around. Bridgend did get chances in the second half but could only convert 3. A great team performance all around and onto next week where Bridgend battle it out for the top spot in the league. Adam Knapp 3, Ian Blatchford 2, Andrew Davis 2, Jon Murphy 2, Ross Allen 1 and Rhydian Lewis 1. Sensationally led by the inspirational Captain Schofield, whilst the energetic pistons were the brilliant young shavers – Wilks M, Milgate, Tudball and Davies. Their speed and power ultimately proved to be too much for Whitchurch, though it must be said that several of the opposition’s own youngsters performed well. Following the early set back, Bridgend struck back with a supremely well executed short corner switch move, converted by Schofield, and then won a penalty stroke just before half time which Wilks J converted. Bridgend’s head of steam built further after the break and wave after wave of terrific passing attacks broke down the Whitchurch defence time and again. The quality of the wide passing was particularly impressive and some of the Wilks M crosses deserved to be converted. On another day they will be. Meanwhile Millgate kept making his trademark tackles to set up the next attack. The one legged Allen scored two very well taken and instinctive goals to ensure the Bridgend loco began to really motor and Wilks J completed the scoring with a flashy strike into the top left hand corner which had the capacity crowd cheering as though watching the Flying Scotsman. 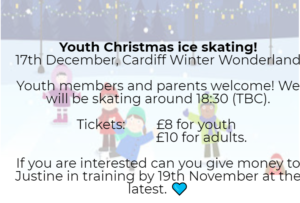 Youth Ice Skating information! Speak to Justine or Bev to book!